Ethnocentrism—our tendency to partition the human world into in-groups and out-groups—pervades societies around the world. Surprisingly, though, few scholars have explored its role in political life. Donald Kinder and Cindy Kam fill this gap with Us Against Them, their definitive explanation of how ethnocentrism shapes American public opinion. Arguing that humans are broadly predisposed to ethnocentrism, Kinder and Kam explore its impact on our attitudes toward an array of issues, including the war on terror, humanitarian assistance, immigration, the sanctity of marriage, and the reform of social programs. The authors ground their study in previous theories from a wide range of disciplines, establishing a new framework for understanding what ethnocentrism is and how it becomes politically consequential. They also marshal a vast trove of survey evidence to identify the conditions under which ethnocentrism shapes public opinion. 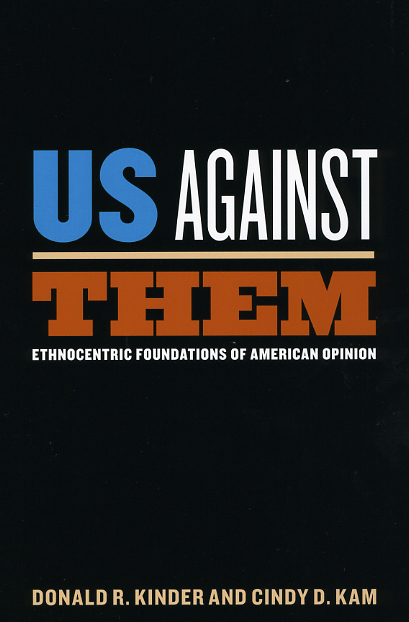 While ethnocentrism is widespread in the United States, the authors demonstrate that its political relevance depends on circumstance. Exploring the implications of these findings for political knowledge, cosmopolitanism, and societies outside the United States, Kinder and Kam add a new dimension to our understanding of how democracy functions.